Born in Shanghai in 1965, Li Lei became immersed in the study and practice of abstract art in 1996. Now, almost twenty years after he began to interpret and express the core concepts of Chinese culture through the language of abstract art, an exhibition of Li Lei’s work takes place in Hong Kong. Equally knowledgeable about Chinese philosophy and Abstract Art of the West, the artist’s creative journey has led him to concentrate on an Abstract Art of the East. Li Lei’s abstract art is deeply imbued with poetry and lyricism and his approach is multi-sensory and interdisciplinary. The exhibition “Water to Water: Abstract Art by Li Lei” is divided into five sections: sections one to four focus on the four seasons of Spring, Summer, Autumn, Winter, while the last section, “Lost in Venice”, focuses on the artist’s contribution the 2015 Venice Biennale. The paintings inspired by the four seasons show nature’s many moods and colours: the seasons that lead into each other show a natural, organic progression while opposite seasons show a dramatic clash. Li Lei’s abstract depictions of the four seasons rely on the rhythms of the brush, astute use of colours and sensitivity to composition. It is an entirely contemporary way of approaching this subject, which, in traditional Chinese art, relies on depictions of flowers specific to each season instead. The “Lost in Venice” section of the exhibition communicates the artist’s recent experience in Venice, where he was one of eleven artists participating in the Biennale’s “Friendship Project – China” organized by The Republic of San Marino. Li Lei was among the artists who transformed the rooms of Venice’s famed 16th century Palazzo Rota Ivancich. Li Lei has created an Abstract Art of the East, but global issues concern him deeply, especially the international language of art. In Venice, he juxtaposed his abstract paintings with long, hanging banners and other objects to give visitors an immersive, multisensory experience as they traversed from room to room in the Palazzo. Li Lei’s life as an artist is driven by immense creativity. He sees the artist as creator and provocateur, and an agent of change whose art is a catalyst guiding viewers through experiences that open doors to the sublime and the highest peaks of aesthetic appreciation. Water is the most malleable and fluid of substances; one of the five elements, it is essential to life. As a moving substance, it is symbolizes both the artist’s creative process and the viewer’s experiential process. Confucius’s well-known adage from the Analects states that “The wise find pleasure in water “. But it is Laozi’s statement in the Daodejing “Water is fluid, soft, and yielding. But water will wear away rock, which is rigid and cannot yield. As a rule, whatever is fluid, soft, and yielding will overcome whatever is rigid and hard” that is most apt. 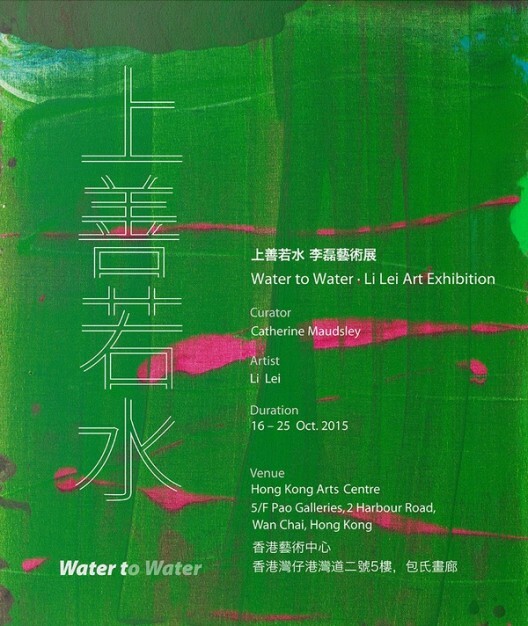 The art exhibited in “Water to Water: Abstract Art by Li Lei” demonstrates the fluidity of Li Lei’s mind. There is nothing remotely rigid or hard in a mind that grapples with universal ideas to reach the core of abstraction. Courtesy of the artist and Hong Kong Arts Centre, for further information please visit www.hkac.org.hk.